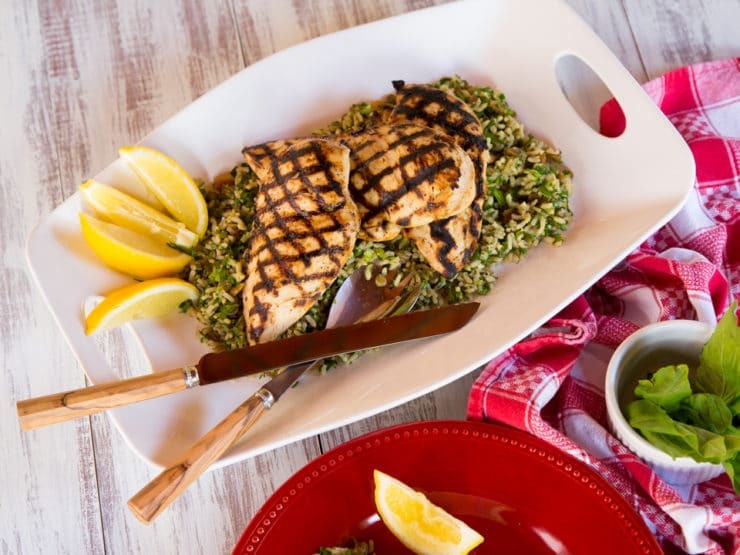 Lemon Basil Grilled Chicken Breasts – Simple, Delicious Summery Marinade Recipe for Chicken. Broil, Bake, Grill or Sauté. The past few months have been pretty busy for me. Behind the scenes of this blog there are a lot of projects “cooking,” some of which have nothing to do with food! To fuel my system and deal with this crazy schedule I’ve developed some easy, healthy recipes that can be made at a moment’s notice. I mean, we all love babka and rugelach, but these types of treats are super time consuming. I thought you all would appreciate some simpler recipes that you can make for a weeknight dinner… or, in this case, a Memorial Day barbecue! 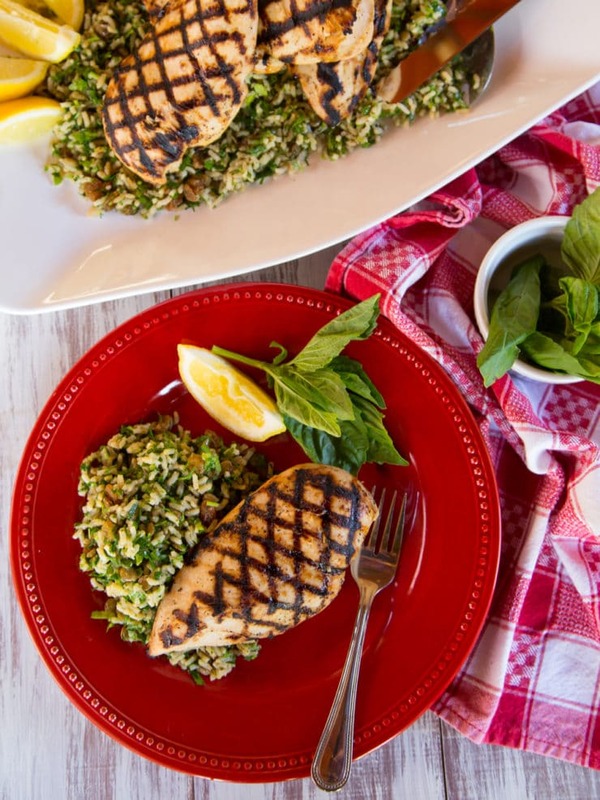 These easy Lemon Basil Grilled Chicken Breasts are packed with flavor. While most days I eat vegetarian, I’ve always said that I’m more of a “flextarian” and lately I’ve been incorporating lean, organic meats into my diet. I wanted to develop a bright and flavorful chicken marinade to reflect the warm days ahead and the combination of lemon and basil turned out to be exactly what I was looking for. 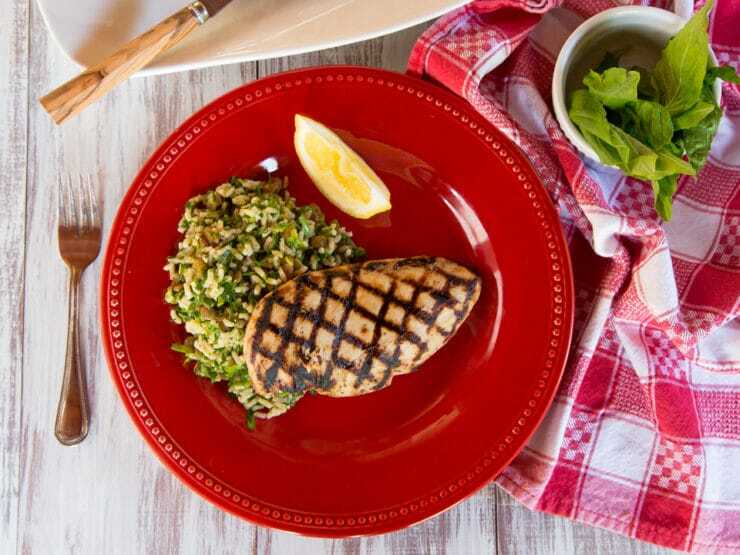 Try this chicken breast on sandwiches, salads or alongside your favorite side dish. I like to grill a few of them, then pull them out as needed for salads, sandwiches, or wraps. A quick smoky grill adds an extra boost of flavor to this tasty marinated chicken. The history of grilling stretches back to caveman days, when a brilliant ancestor of ours discovered that holding meat directly over an open flame for an extended period of time “cooked” the meat. Most likely, cavemen stumbled upon animals that had been killed in forest fires. After scavenging the meat, they found it easier to digest than the raw stuff (I’m sure the improved flavor was also a plus!). it’s impossible to pinpoint exactly where this cooking method was first used. Anthropologists have never come to a consensus on when our earliest ancestors first learned to “cook” and prepare food. Current estimates place the advent of cooking anywhere between 2 million and 300,000 years ago—a pretty wide range. So on the grilling front, the best I can do is thank Mister Caveman or Miss Cavewoman for his or her remarkable contribution to our cooking heritage. You can read more about the history of grilling (and barbecue!) here. 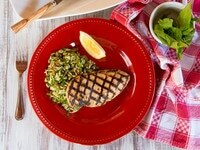 Simple, delicious summery marinade recipe for chicken. Broil, bake, grill or sauté. Easy, fast and delicious. 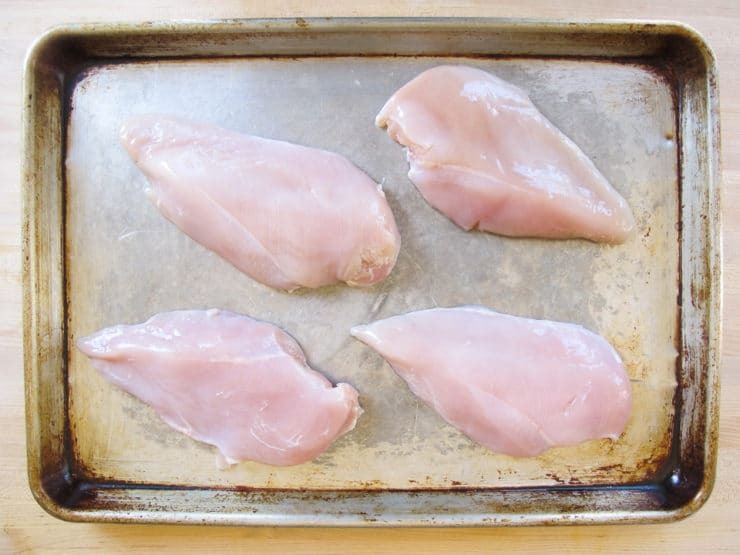 Rinse your chicken breasts and trim off any fat. Combine all ingredients, except for the chicken, in a large, resealable plastic bag. Close the bag and use your hands to work the ingredients together. Open the bag and add the chicken breast. Remove as much air from the bag as possible before re-sealing. Massage chicken with marinade until it appears to be well covered. 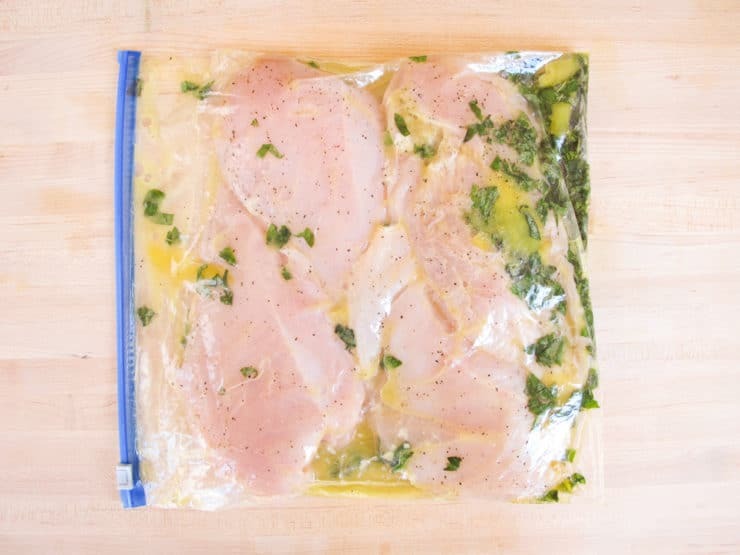 Marinate chicken in the refrigerator for 4 hours, or overnight. Overnight is preferred. Use within 2 days. The chicken can also be frozen for up to 6 weeks. When ready to cook, remove chicken from the bag, remove any large chunks of basil or lemon zest that sticks to the chicken. If cooking from frozen, allow the chicken to thaw in the fridge overnight. 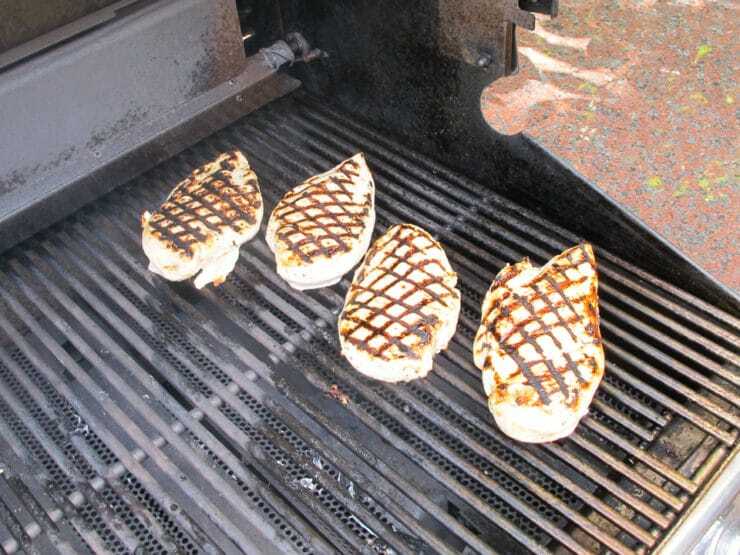 Preheat grill on high heat, do not start with a cold grill or the chicken will stick. Once hot, place the chicken on the grill and cook for 2 minutes. You should be able to easily lift the chicken breast and see dark grill marks. If the chicken sticks to the grill, give it an extra 30 seconds and try again. Reduce heat to medium and flip the chicken, cook for an additional 8 to 10 minutes, until the juices run clear or the thickest part of the breast reaches an internal temperature of 165 degrees F.
Serve the chicken with your favorite summer side dish. It's great with rice and over salads. Alternatively this recipe can be made using your favorite method for cooking chicken breast, just remember to cook until the the thickest part of the breast reaches an internal temperature of 165 degrees F.
I’m new to cooking meat and don’t have a grill. Any other suggested ways to cook? Saute or bake maybe, and how long/at what temperature? Hi Sydni, Tori’s assistant Ashley here. You can bake the chicken breasts in a 350 degree oven until they reach an internal temp of 165 degrees F. This usually takes about a half hour. I too would like to see the rice recipe. I searched carefully o this site through the “side Dishes’ section, but it wasn’t there. Nor was it under a new search string called ‘rice’. I think I see a bean in one picture and the rice is probably Basmati, but which green herb is being used to compliment the somewhat strong flavors of basil, and, to a lesser extent the lemon? I might try parsley or cilantro or? I wish someone was looking at these comments because the initial two questions were posted more than one year ago without being answered. Tori??? Help us! We love you and thank you! :::swoon:::! :::ker-THUNK! ::: Mmmm…looks wonderful, Tori! Love that it’s simple ingredients and looks delish as always?? That rice looks great too! !